Nagged by scaremongers and ‘besserwissers’ about every aspect of child-rearing, parents are tired of being told what to do. Little wonder then that an alternative approach is gaining ground. From the moment a couple decide they are going to try for a kid a deluge of parenting books and advice is heaped upon them. This booming industry has put a premium on all things baby and child ever since parenthood became a lifestyle project and something to schedule into a busy and successful career and ‘Me centred’ world. While this approach to parenting is still going strong, emerging currents and influences are showing tomorrow’s parents a new way. The well documented failings of authorities, institutions and ‘experts’ are all the more galling when this same crowd turn around and blame parents for everything from public disorder and increased childhood obesity to the so-called ADHD epidemic. Tired of the advice, the ‘rampant consumerism’ and the political correctness, many parents are seeking out alternative values. Focus is shifting from status and keeping up with the Joneses – to a new social approach of sitting down and having a chat with the Joneses, or the Olsons, or the Patels while the kids are playing… on their own. In 2008 mum Lenore Skenazy let her 9 year old son ride the New York Subway alone causing a firestorm of outrage from concerned people around the world. A few years and a prolonged recession later, a movement called ‘Free Range Kids’ is mushrooming. 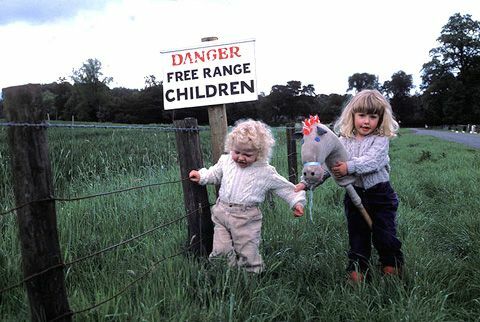 ‘Free Range Kids’ is about rejecting a fear-based approach to child rearing. It means letting go of some control, trusting your children and – even more daring – having faith in your fellow citizens, those ‘strangers’ your kids may encounter when they are out exploring their world on their own. Maybe there really is a different way. Alain De Botten from The School of Life said that: “The Idle Parent is the most helpful and consoling child-raising manual I’ve yet read”. Take a moment to consider ‘The Manifesto of the Idle Parent’. In the, The Idle Parent Tom Hodgkinson argues that both kids and adult alike need to play more and work less. We make far too much fuss about parenting. Leaving kids alone to have fun and explore the world around them means they will become more self-reliant, more active and sleep better. They may, in fact, grow into precisely the kind of happy and well-adjusted adults we wish them to be.